Hace unos días se conocían varios proyectos, el de Alcalá de Henares es el más avanzado, que tienen la intención de desarrollar en la provincia de Madrid redes de calor con la hibridación de biomasa, termosolar de concentración y gas. En Dinamarca ya se ha conseguido, prescindiendo del gas. Hace un par de semanas se presentaba en Aalborg. “El sistema presenta la primera planta de cogeneración de Dinamarca, pero también de todo el mundo, que integra energía termosolar de concentración y una caldera de biomasa, mientras que también utiliza el ciclo orgánico de Rankine (ORC, en sus siglas en inglés) para convertir la energía en calefacción urbana y electricidad”. Así lo explica la empresa que ha desarrollado el proyecto: Aalborg CSP A/S. Se confirma así el liderazgo de Dinamarca en la implantación de redes urbanas de distribución de energía de cuarta generación. En un reportaje publicado en el número de septiembre de Energías Renovables se citaba a la Universidad de Aalborg como uno de los focos mundiales de investigación para integrar sistemas inteligentes de energía, incluidas redes de electricidad, gas y térmica, con edificios más eficientes energéticamente, claves de esa cuarta generación. Desde Aalborg CSP A/S confirman que “los beneficios que aportan estas tecnologías innovadoras permiten a la planta de calefacción urbana Brønderslev Forsyning lograr una eficiencia energética récord, precios de energía más bajos y una solución de futuro que no depende de los precios fluctuantes de los combustibles fósiles”. Aunque la inauguración oficial tuvo lugar a mediados de marzo, con la presencia de los ministros daneses de Energía, Servicios Públicos y Clima y de Hacienda, la planta termosolar de concentración, que ocupa casi tres hectáreas, lleva en funcionamiento desde 2016. La puesta en marcha en línea de la caldera de biomasa y la unidad de ORC ha conseguido completar el sistema de cogeneración, que en conjunto ha supuesto una inversión de 45 millones de euros. Compared to steam turbines based on a water circuit, ORC installations make it possible to recover heat from low-temperature sources available in small-capacity plants. An ORC system can work well in concert with biomass combustion and solar concentrating units. The system was named for its use of an organic fluid characterised by high molecular mass and a liquid-vapour phase change at temperatures below water-steam transformation. The ORC unit in Brønderslev will come from Italian-based Turboden. Turboden has implemented around 300 ORC units all over Europe in recent years, according to a document by DTU, the Technical University of Denmark (see the document attached). The parabolic trough field was delivered and installed by Danish-based Aalborg CSP. It came online in spring 2017 and has since been feeding into the town’s district heating network. Once the ORC system is put into operation, as is planned for April 2018, solar energy – collected via thermal oil at around 300 °C – is said to be used for fuelling it. “By the end of this July, the collector field will have produced 6,500 MWh, and we expect 16,000 MWh from year-round operation,” said Thorkil Neergaard, Managing Director of Brønderslev Forsyning. This would translate into a specific yield of 594 kWh/m²a. Both biomass systems are said to start producing heat late this year. Neergaard expects gas to be used only during very cold periods and perhaps the units could be stopped during some years completely. Concentrated solar power systems have until recently focused on bulk electricity production, with the main focus on solar towers and trough type collectors. Recent developments have focused on smaller units to supplement thermal power stations and to provide heat for industrial processes. Collectors based on the linear Fresnel reflector design are leading the pack. There is a gap in the market between non-concentrating rooftop collectors used for solar heating and large scale systems used for bulk electricity generation. This gap is being filled by systems which use linear instead of circular focusing. Two main systems are the solar trough and the linear Fresnel (LFR) based collector. Although the trough based system has proven itself over many years of operation in different applications, the Fresnel system is emerging as an alternative with several advantages. Fig. 1: Typical large scale LFR system . LFR plant is highly modular, ranging from a few hundred kW to several MW in size, and offers the lowest land occupancy compared to other CSP technologies. 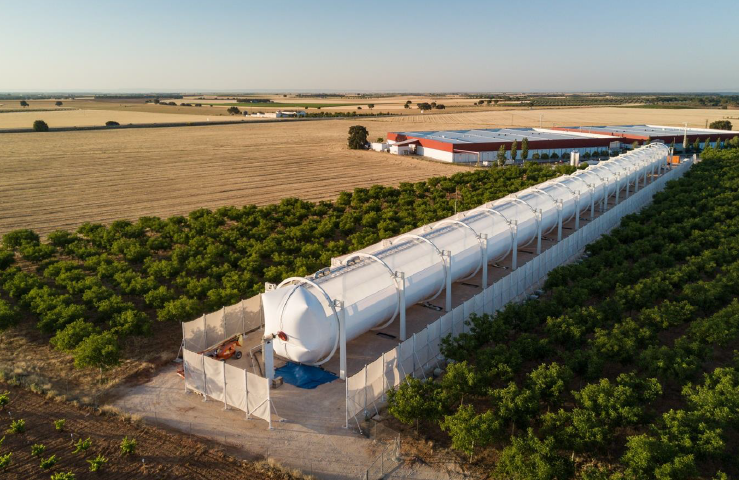 Parabolic troughs represent the optimal solution for achievable concentration ratio and achievable energy yield per aperture area and, hence, the best overall plant efficiency in line-focussing mirror systems. For that reason CSP development efforts have concentrated on parabolic trough geometry. Nevertheless, in the last decade LFR systems have aroused an increasing interest. The main reason for this is the search for cheaper solar field solutions. The considerable economic advantages of Fresnel collectors are principally related to their constructive simplicity. In addition, Fresnel solar fields permit higher land use efficiency than any other type of solar fields. These advantages can offset the lower solar-to-heat efficiency, and LFR power plants represent an interesting alternative to parabolic trough power plants . Fig. 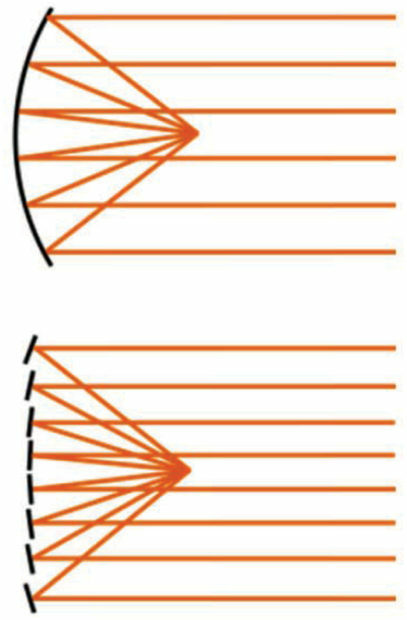 2: Principle of Fresnel mirror system . The main advantage of LFR systems is that their simple design of flat or flexibly bent mirrors and fixed receivers requires lower investment costs and offers a wide range of configurations. Originally designed for low and medium power applications, LFRs are now being designed for higher temperatures which facilitate direct steam generation (DSG) which can be used efficiently in the industrial or power generation sector. Fresnel systems can be configured to operate over a wide range of temperatures, from 200 to 500°C, although systems with temperatures as high as 550°C are under development. Applications range from industrial process heat, distributed power generation using the organic Rankin cycle to steam turbine systems. 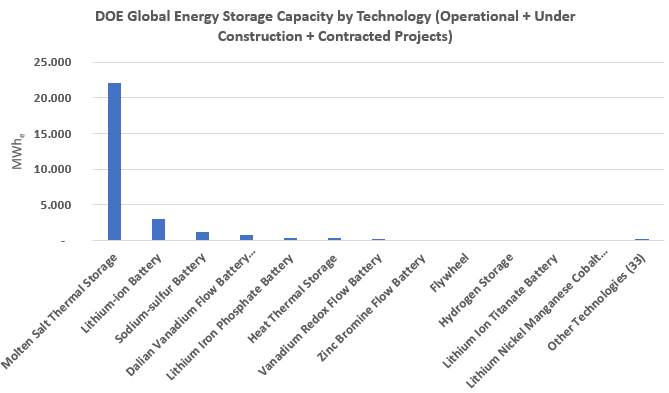 Developments in energy efficiency in both industry and power generation have focused attention on medium and high temperature solar thermal systems. LFRs have great potential in southern Africa due to the low cost and high percentage of local manufacture inherent in the technology. The linear Fresnel reflector technology receives its name from the Fresnel lens, which was developed by the French physicist Augustin-Jean Fresnel for lighthouses in the 18th century. The principle of this lens is the breaking of the continuous surface of a standard lens into a set of surfaces with discontinuities between them. This allows a substantial reduction in thickness (and thus weight and volume) of the lens, at the expense of reducing the imaging quality of the lens. Where the purpose is to focus a source of light this impact on the image quality is not of major importance . The principle of dividing an optical element into segments which have the same (or a very similar) optical effect as the original optical element can also be applied to mirrors. It is possible to divide a parabolic mirror into annular segments, forming a circular Fresnel mirror which focuses the light that arrives in rays parallel to the optical axis onto the focal point of the paraboloid mirror. In an analogous way, a linear Fresnel mirror can be constructed substituting a parabolic trough by linear segments that focus the radiation that arrives in a plane parallel to the symmetry plane of the parabolic trough onto the focal line of the parabolic trough. A LFR has a similar effect to a parabolic trough, when considering the concentration of the radiation in a focal line i.e. a LFR behaves like a parabolic trough with the same focal length and the same aperture . The mirrors focus the sun onto a receiver which contains the heat transfer medium which could be water, oil or even molten salt in some designs. The heat transfer medium used will depend on the operating temperature of the system. The main difference between the two systems lies in the way that the sun’s rays are tracked, and this is what gives rise to the cheaper cost of Fresnel. In the trough system the whole structure rotates about an axis coincident with the focal point of the trough. This means that the mirrors and the collector are connected mechanically, requiring bearings through which the collector tube must pass. 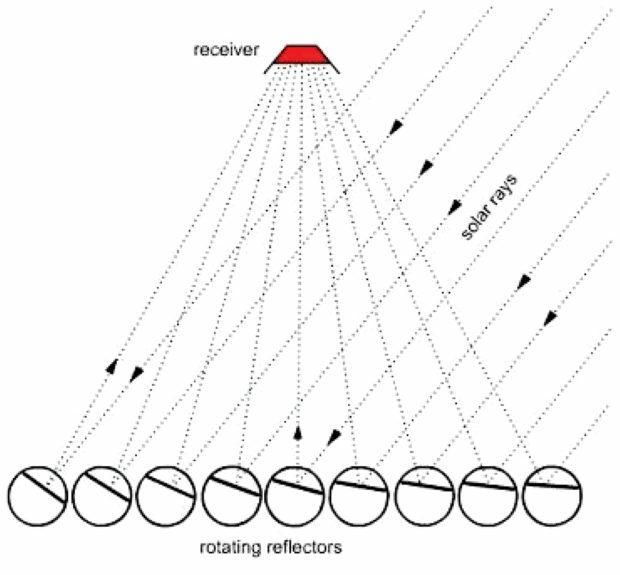 In the Fresnel system the individual mirrors rotate to track the sun. There is no mechanical connection between the mirrors and the collector. Separation of the mirrors and the receiver allows high temperature heat transfer mediums to be used, and also a much wider scope in the design of the receiver. The Fresnel system also allows individual control of each mirror, effectively changing the configuration of the reflector to optimise its function. Fig. 3: Mirror tracking with Fresnel system . The mirror aperture is the area of the reflector mirrors in the horizontal position, and defines the amount of solar radiation collected by the LFR. Aperture is usually quoted on a module or single mirror length basis. Increasing the mirror aperture increases the amount of solar radiation reflected to the receiver module. Typical aperture widths for large systems are of the order of 15 m.
The receiver aperture is the area of the receiver per mirror or module length, and varies according to the design of the system. Receiver width is close to the mirror width, but may be less if curved mirrors are used, or wider if other focusing methods are used. Mirrors may be flat or elastically curved and are generally constructed of glass with a composite/metal backing, although other materials are finding their way into the sector. Adding curvature to the mirror increases the concentration ratio and makes the design of the receiver simpler. Mirror width and length will depend on the design. The mirrors are mounted in the tracking system in several different ways. A typical mounting would be a circular loop driven by a tracking motor (Fig. 4). The receiver generally consists of a secondary reflector mounted above the receiver tube which contains the heat transfer fluid. The receiver may consist of a single tube or several tubes, which may be contained in a vacuum glass tube enclosure. Typical designs are shown in Fig. 5. Fig. 4: Mounting and tracking system . The LFR system alone cannot reach the same radiation concentration as a parabolic trough. The sun changes its position in relation to the optical axis plane of the system. It is theoretically impossible to design the curvature of the individual mirror strips in such a way that there is always a sharp focal line for parallel radiation, and it is necessary to mitigate the unavoidable optical inaccuracy of the Fresnel collector. This can be done by a secondary concentrator that is located above the receiver tubes. The collector concentration ratio is the ratio of mirror aperture to receiver aperture. The low-profile setting of LFR collectors maximises the concentration ratio, which enables high temperature output. Fundamentally, increasing the mirror aperture allows more sunlight to be reflected onto the receiver. Because the low-profile architecture provides for great flexibility in the selection of length and concentration ratio, linear Fresnel collectors can be readily tailored for different target temperatures to meet varying application needs, thus providing practical versatility of usage. As an example, the Fresdemo system has a primary mirror field width of 21 m and a receiver width of 0,5 m, giving a concentration ratio of 42 . The fixed design of the receiver gives a wide choice of heat transfer fluids. Water is used as the transfer fluid at low temperatures, oil as temperatures increase, steam for much higher temperatures and molten salt for the highest ranges. In addition, pressurised CO2 or air are being considered for higher temperature operation . LFR exhibit optical conversion efficiency in the region of 65%. Conversion efficiency depends on the angle of incidence of the sun, and thus average efficiency will vary with latitude. Thermal peak output of 562 W/m2 in terms of primary reflector aperture area, and 375 W/m2 in terms of installation area usage, is claimed for a typical commercially available system . Fig. 5a: Secondary concentrator on receiver . Medium heat systems for industrial applications or supplementary power systems operate in the temperature range 100 to 250°C and may use water or oil as the heat transfer medium. There are numerous systems of this type in operation. Steam as heat transfer fluid allows higher temperatures because there is no danger of thermo oil cracking. Novatec Solar is planning a new Fresnel power plant generation that operates at 450°C . The number of construction components can be reduced because no heat exchange has to be realised between a solar field heat transfer fluid/thermo oil) and Rankine cycle working fluid (water/steam). The thermo oil itself is an expensive component of CSP plants, so the lack of thermo oil is a direct advantage. As there is no heat transfer between two heat transfer fluids, there is one thermal loss factor less. The use of steam as a heat transfer fluid may reduce the mean heat transfer fluid temperature in the absorber tube (even at higher final temperatures) and reduce thermal losses. This reduction is possible because in a large part of the receivers the boiling process is realised, which takes place at a reduced temperature. Only in the small part, where the superheating of the steam is realised (if there is superheating), high temperatures are reached. Water has further advantages in comparison to other HTFs: It is environmentally friendlier than thermo oil so that leakages in a steam generating plant do not produce environmental dangers. Fig. 5b: Secondary reflector multiple tube technology (Ausral). Water is less corrosive than salt. Its freezing temperature is much lower than the freezing temperature of salt and even slightly lower than of thermo oil. The effort required to ensure adequate anti-freeze protection is reduced significantly. There are several systems on the market that use DSG. In this system water is fed through pipes in the receiver where it is converted to steam and then to superheated steam. Steam is used to drive turbines directly or as supplementary heating for thermal power plants. Steam is also used for industrial purposes. High temperature systems (≈550°C) using molten salt as the heat transfer medium have been developed. Such systems incorporate heat storage systems for prolonged operation. Fig. 6 shows a high temperature plant using salt as the heat transfer medium . Because of the simplicity of design and the high operating temperatures now possible, LFR are being considered as alternatives to tower and heliostat based CSP systems. In addition, the short optical path between mirror and receiver eliminates many of the tracking problems as well as environmental objections associated with tower/heliostat based systems. In addition LFR salt based systems are able to recover from “salt freezing”. 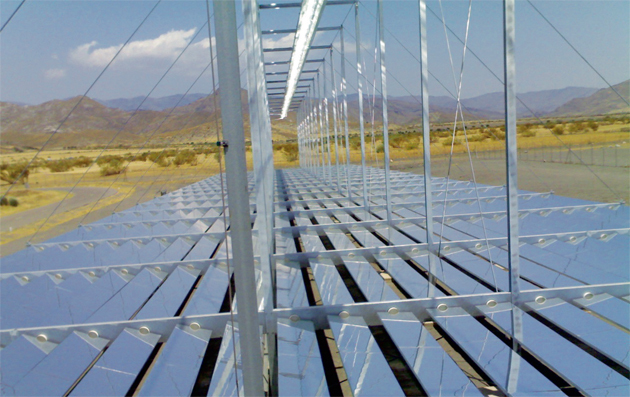 Fresnel mirrors are being considered as a means to supplement heat in thermal power stations. Parts of the cycle such as preheating of the boiler feed water use low to medium temperature heat sources, and solar thermal systems can provide this heat. Typical applications are to substitute the bleed steam used for preheating boiler feedwater as shown in Fig. 7. Fig. 6: High temperature CLF system using molten salt . 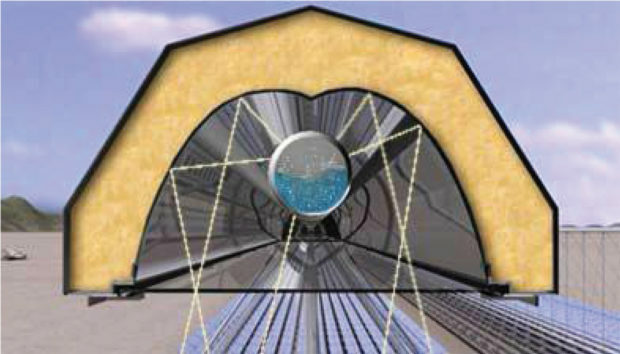 The solar heat source is connected in parallel with the bled steam source and when available provides the heat normally used from the steam. The increased steam output then enables additional power generation from the turbine (solar boosting mode) or fuel consumption can be reduced (fuel saver mode). Increase in the power generation capacity of the plant during periods when solar power is available. Decrease in coal consumption with no increase in power generation. 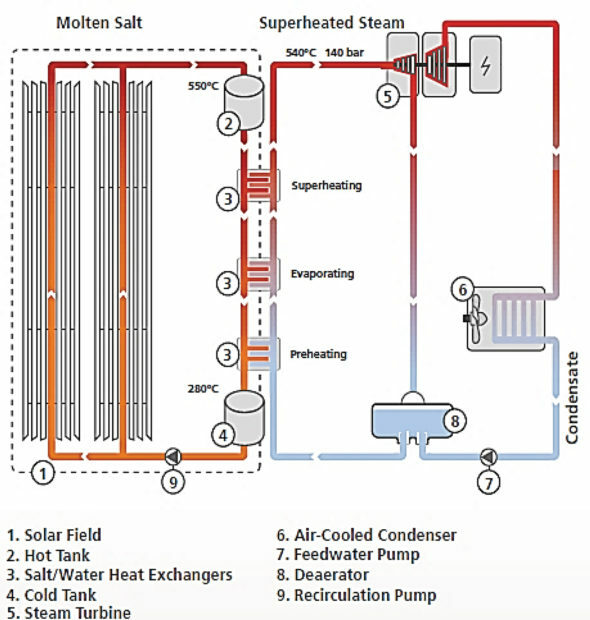 The integration of solar thermal collectors into conventional fossil plants, or solar aided power generation (SAPG), has proven a viable solution to address the intermittency of power generation and combines the environmental benefits of solar power plants with the efficiency and reliability of fossil power plants. In SAPG technology, thermal oil can be used as solar heat carrier and no solar steam needs to be generated, therefore the pressure of solar system can be much lower than that of the solar collector using water/steam as the heat carrier. Newer developments make use of the higher heat content of solar steam directly, provided from DSG plants. The temperature of the heat source is one of the major defining factors of a power plant – higher temperature results in higher overall power plant efficiency. With SAPG, the heat source temperature is not limited by the solar input temperature and is therefore an effective means of utilising low or medium solar heat (250°C) for power generation. However, internationally the adoption of the technology has been slow, despite it being a viable and quick means of CO2 emission reduction. A study was conducted on a simulated SAPG power plant at Lephalale, which was based on a generic 600 MW subcritical fossil power plant with a reheater and regenerative Rankine cycle with two low pressure feedwater heaters (FWH) downstream of the deaerator and three high-pressure FWHs upstream . Fig. 7: Single-stage regenerative Rankine cycle with open feedwater heater . 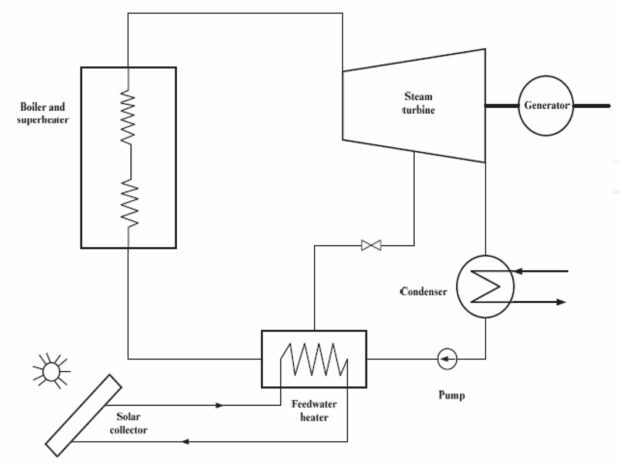 This study showed that integrating solar thermal with steam plant is approximately 1,5 times as efficient at converting solar energy to electricity as a CSP stand-alone generating plant. Therefore, a solar assisted high pressure feedwater heater system at an existing coal-fired power station is 1,8 times more cost-effective than a stand-alone CSP plant. The conversion efficiency is claimed to be of the same order as solar PV . The Fresnel mirror solution is gaining popularity because of cost and simplicity advantages over the parabolic trough solution for SAPG systems. Costs of the Fresnel based system are estimated to be approximately 70% of the equivalent parabolic trough system . M Gunter: “Linear Fresnel Technology”, DLR, www.energy-science.org/bibliotheque/cours/1361468614Chapter%2006%20Fresnel.pdf M J Montes, et al: “A comparative analysis of configurations of linear Fresnel collectors for concentrating solar power”, Energy, 2014. 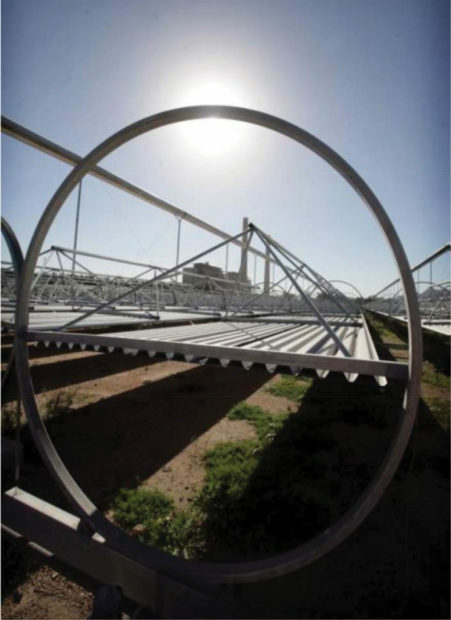 Novatec: “Concentrated solar power by Novatec solar”, Brochure. E Hu, et al: “Solar Aided Power Generation: Generating Green Power from Conventional Fossil Fuelled Power Stations”, Intech open science. W Pierce, et al: “A comparison of solar aided power generation (SAPG) and stand-alone concentrating solar power (CSP): A South African case study”, Applied Thermal Engineering, 2013. Areva: “Areva integrates energy storage in solar CFLR design at Sandia national labs”, http://us.areva.com/EN/home-1977/areva-solar-power-salt-storage.html S Benmarraz: “Linear Fresnel Reflectors Concentrated Solar Power: cost reduction and performance improvement trends”, IRENA Workshop, March 2015. 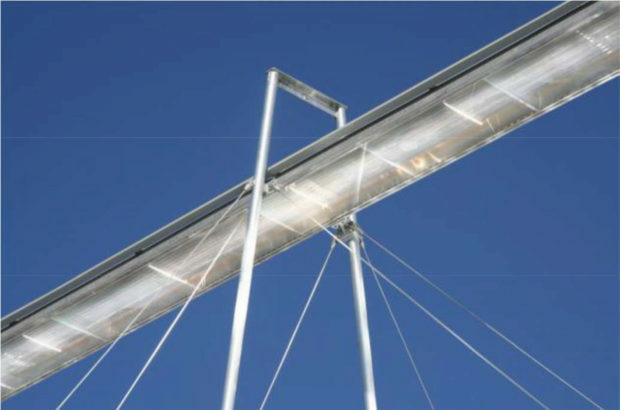 Industrial solar: “Industrial Solar linear Fresnel collector LF-11”, Technical brochure. Más de 500 plantas industriales en todo el mundo confían en el calor solar. 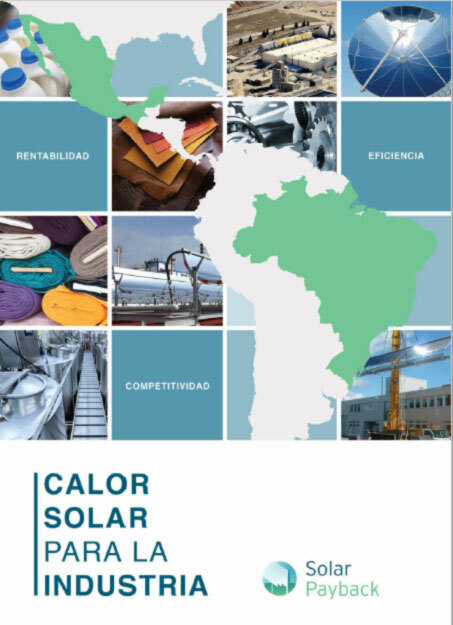 SHIP significa “Solar Heat for Industrial Processes” (calor solar para procesos industriales) y describe aquellos sistemas que proporcionan calor solar en una fábrica. El campo de colectores calienta un fluido de proceso mediante la radiación solar y un intercambiador de calor transfiere este calor a un sistema de suministro o proceso de producción en la fábrica en forma de agua caliente, flujo de aire o vapor. Las unidades de almacenamiento hacen posible utilizar el calor generado durante la noche. Madrid, 6 de junio de 2017.- La Autoridad de Electricidad y Agua de Dubái (Dewa) ha anunciado los precios de licitación de los cuatro consorcios que optan al desarrollo de la cuarta fase de 200 megavatios del parque solar Mohammed bin Rashid Al Maktoum. 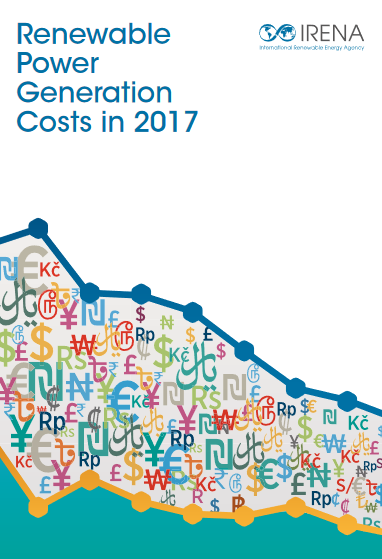 La oferta más baja presentada para el proyecto de energía solar concentrada (CSP) es de 9,45 centavos de dólar (8,40 céntimos de euro) por kWh, lo que supone un descenso de casi el 40% del precio mundial más bajo ofertado hasta el momento. Otras dos ofertas también presentaron precios inferiores a los 10 céntimos de euro por kWh. Protermosolar es la asociación que representa al sector español de la industria solar termoeléctrica y está integrada por 50 miembros. La tecnología termosolar, en la que España es líder internacional, ha irrumpido recientemente con fuerza en el panorama de las energías renovables a nivel mundial y actualmente cuenta con un gran potencial de crecimiento por su gestionabilidad y capacidad de almacenamiento, por su elevada creación de empleo local y por su potencial de reducción de costes. La potencia instalada en España es de 2.300 MW y la contribución de las empresas españolas en los mercados internacionales es de alrededor del 75%.